Slicing and resequencing loops and samples is a long-standing tradition in hip hop and electronic music. In the early days of sampling, producers used the EMU SP-1200 and other hardware samplers of the era that could only record and save small amounts of audio data that ultimately limited the options for processing the sounds. Today, we can use computers and advanced hardware samplers to manipulate sounds with incredible power and precision. In particular, we will look at Native Instruments’ MASCHINE, an industry-standard groovebox that lets you effortlessly produce beats, melodies, and harmonies with powerful drum synths, premium sounds, an integrated sampler, and more for ultra-smooth workflow. This tutorial demonstrates how to use Native Instruments’ MASCHINE to slice and dice the legendary 4 bar Amen Break, a drum solo performed by Gregory Cylvester ‘G.C.’ Coleman in the song ‘Amen, Brother’ by the 1960s funk and soul outfit The Winstons. This famous drum loop was heavily used in early hip hop, sample-based music, and later becoming the foundation for drum-and-bass and jungle music. Arguably the most sampled drum beat of all time, the Amen Break can be heard in countless examples of breakbeat, hip hop, reggae, and electronic music around the world. 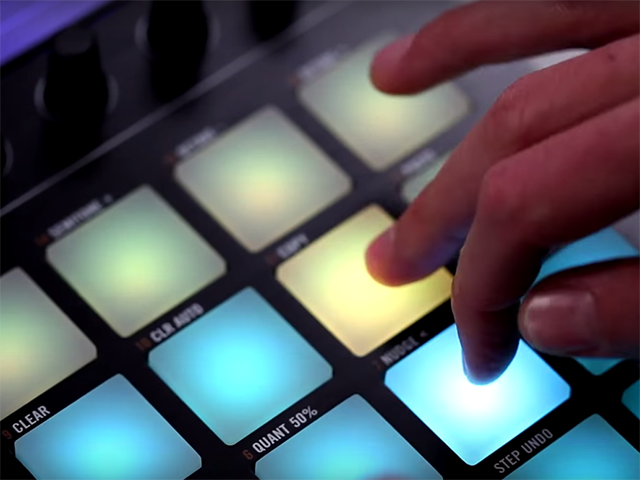 Native Instruments’ MASCHINE is one of the most easiest and intuitive pieces of gear to use for working with sampled material. Its many features give users unlimited ability to chop, shape, and manipulate samples from any source. Let’s dive in deeper and check out a common technique for importing a sample and chopping it up into usable parts that can be played across MASCHINE’s Pads. To kick the process off, download and import the Amen Break sample file into MASCHINE by first clicking the Disk Button to bring up your file directory and navigating to where the sample is located on your hard drive. Next, click the Import Button at the bottom of the directory window to begin importing the audio. The Tag Editor will open giving you the option to tag the sample before importing it into your library. You can organize the sample by Bank, Type, and Subtype to make it easier to locate samples from the Browser. After you’re finished tagging, click the OK Button to import the sample into your library and apply the selected tags. The original Amen Break can be downloaded from Freesound here. Now that the sample is imported let’s load it from MASCHINE’s Browser and drag it to an empty Sound Slot. Next, either press the Sampling Button on the MASCHINE controller or click the Sampling Button using the included software which is the third button on the strip directly to the left of your sounds. Let’s edit the sample down to an even loop length so it is easier to work with and more likely to sync up to your project’s tempo. First, click the Edit Tab so we can adjust the Start and End points of the sample to create a loop. Next, adjust the Start and End points by dragging the small gray icons labeled ‘S’ for Start and ‘E’ for End using the mouse. If you want to have a bigger view of what’s happening, use the Magnifier Icon in the lower left of the screen by dragging it to the right to zoom in on the waveform and left to zoom out. Now that the Start and End points are set let’s highlight the section of the loop we will be working with by clicking on the Enable Button to enable the Loop Area. 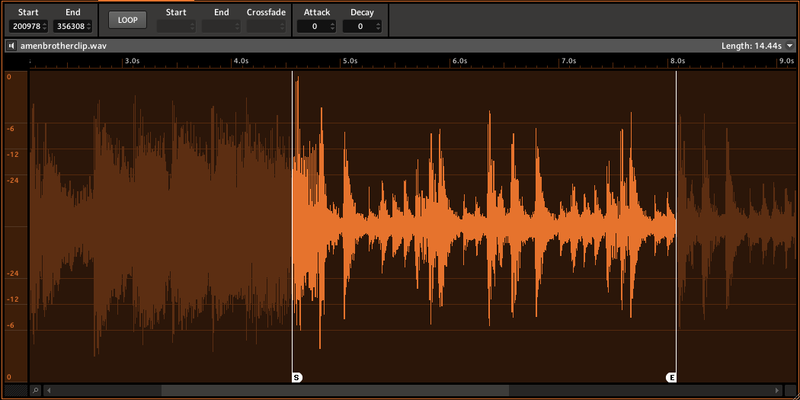 Slicing a sample is useful if you want to rearrange loops or make them play correctly at another tempo. With the Loop Area highlighted, either click the Audio Button on the MASCHINE controller or click the small drop-down arrow on the right side of the Edit Tab screen in the software to reveal a menu of audio editing functions. Choose ‘Truncate’ from the menu to delete the unused part of the sample that is outside of the selected region. We should now be left with only the audio we want to slice into smaller parts. Next, click on the Slice Tab to begin the process of slicing up the sample. The loop should now have 16 equally spread vertical lines in the waveform where the slices are going to be applied. By default, Split Mode is set which will automatically slice audio into equally spread regions. 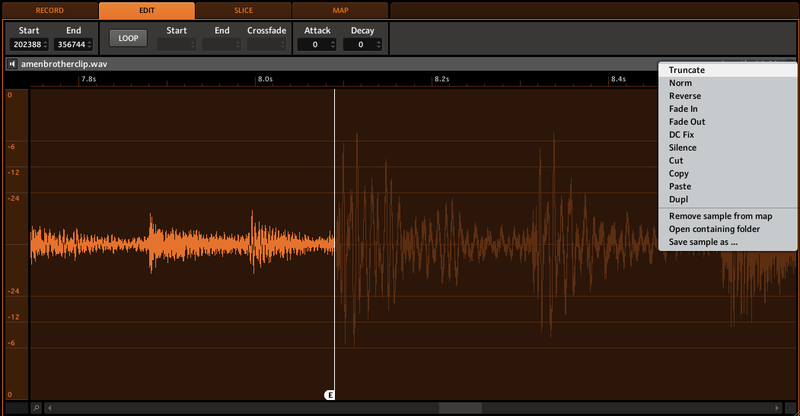 You can also try Detect Mode to slice the audio according to its transients or Grid Mode to slice according to note values. Now click on the Apply Button to slice the currently selected sample. Alternatively, you can also click the Slice Dragger and drag the sliced sample onto another Sound or Group Slot. After clicking Apply, the Piano Roll/Keyboard Editor will open automatically displaying all 16 slices as notes that can now be played using the Pads. Alternatively, you can choose a different Sound or Group Slot to put the slices on by using the ‘Apply To’ function. This is achieved by clicking and holding down the mouse button on the 4-way arrow looking button directly to the right of the Apply Button and then dragging your mouse over an empty Group Slot and releasing the mouse button to spread the 16 slices across the empty Pads. One great thing about using the ‘Apply To’ function like this is that you can easily go back and edit your clips by entering the Sampling Mode again. Now that we have are Amen Break sliced up and spread across the Pads its time to jam around and discover creative new ways to use the slices in context with your current project. 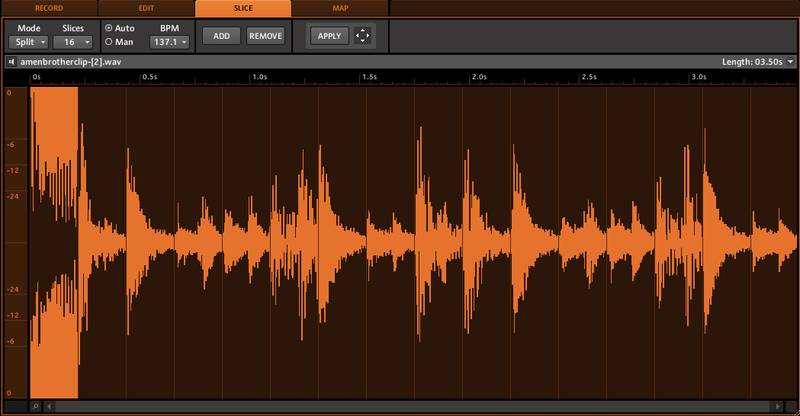 Try using the Note Repeat to make the slices stutter or various other audio effects to manipulate the slices further. Using the Amen Break creatively has become a rite of passage for many producers, each finding a way to use it in their own unique way. Sampling and editing the break yourself is a great way to practice some new sampling techniques using MASCHINE while working with a classic sound that has spawned several subcultures in music history.